The Main Railway Station in Kraków was opened in 1947 - today it services around 20.000 passengers a day, being a vital communication center in this part of Poland. It is one of the most modern train stations in our country, as well as the first A-class underground station according to the PKP standards. The station has 5 platforms, 28 cash registers (opened 24/7), and numerous ticket machines available both at the station and in the Galeria Krakowska shopping center. Additionally, it comes equipped with overground passes and 3 underground ones. The area surrounding the station offers access to various services, information points, and commercial spaces. The Main Railway Station is situated in the central area of Kraków in the immediate vicinity of the PKS bus station and the Galeria Krakowska shopping center (connected with the train station). The central hall is situated right above the so-called Kraków's fast-tram line - the stops of the most popular bus/tram lines are located just 500m away, allowing fast access to just any part of the city. The 2-level regional PKS bus station is also close-by. Finally, the Main Railway Station services the line which connects Kraków's with the Balice Airport. 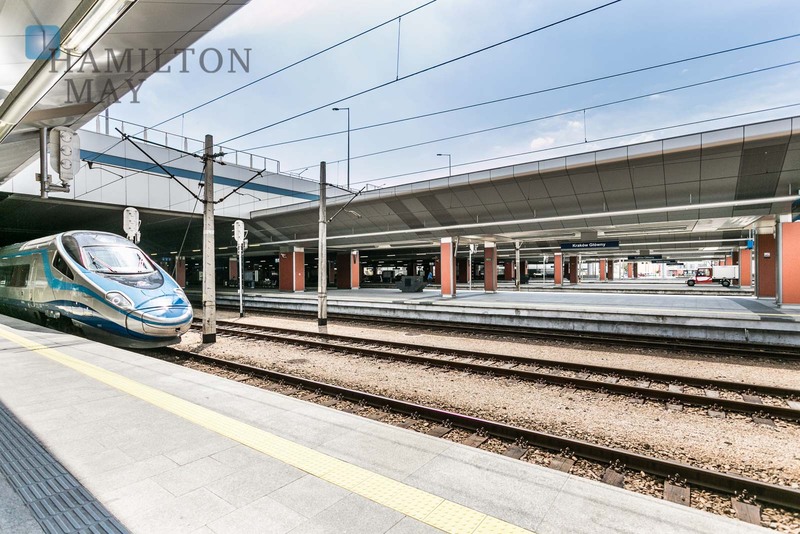 Hamilton May regularly receives inquiries from various individuals and entire families moving to Kraków, searching for apartments available for rent in the vicinity of the Main Railway Station. Our Agency provides a wide choice of meticulously selected properties, which meet the typical criteria; floorspace of at least 40m2 and property's layout featuring one or more rooms.